Finally, the long-awaited CFS Grand Opening! I arrived early to mop the floor, finish some last-minute preparations, and complete today’s WOD. Luke had an upset stomach and requested numerous small walks. He ate grass, and then vomited. On the just-mopped floor. And that’s okay. I’m relieved that he was able to get everything out of his system before he began his mascot and host duties. Speaking of relieved, I can’t begin to describe just how relieved I am that CFS is finally open for business. In addition to being relieved, I’m exceedingly excited! 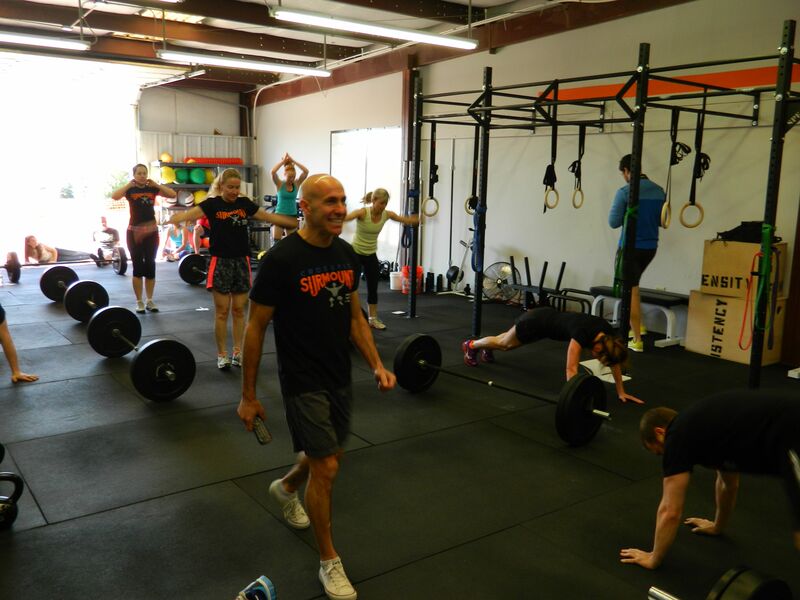 WODs were held at 8:45, 9:30, and 10:15 and, as expected, few people attended the first and many attended the last WOD. My public apology to Sam, who wasn’t able to participate in the 10:15 WOD because we ran out of plates – but who crushed the Community WOD. New Rule at CFS: Unless the inside and/or outside temperate is greater than 80 degrees, shirts are required. My mother and I have much in common. Jeff’s mother, Brenda, is one of the sweetest, kindest, most generous people that I have ever met. She arranged for all of the refreshments! Angie often matches her shirt and shoes. I enjoy coaching one-on-one, small groups, and large groups. Uhm, I guess I just enjoy coaching. Amy Scott is a wonderful hugger. It wasn’t until after 3 that I was able to do so. I wasn’t the least bit disappointed! I set A, B, & C goals. A: Complete all burpees unbroken and all rounds of HRPUs and DLs unbroken. B. Complete all burpees unbroken and 5 minutes of HRPUs and DLs unbroken. C. Complete 50 unbroken burpees and 5 minutes of HRPUs and DLs unbroken. I was confident that I could complete 5 minutes of unbroken burpees. I wasn’t so sure, however, that I could complete more than 10 unbroken HRPUs and DLs – particularly since 6-count burpees, well, include a strict pushup. My strategy was to complete burpees at an even pace, and that’s what I did. I wasn’t the least bit tempted to rest, even though I had thought I’d do so after 50 burpees. I completed exactly 70 burpees with 1 second remaining. The minute of rest was more than enough, and I was ready to get started with 15 seconds remaining. While I can’t recall exactly when I reached milestones, e.g., round of 10 HRPUs and DLs, after I passed the 5-minute mark I was still feeling strong. I also recall thinking that I’d probably only be able to complete 10 unbroken HRPUs. I kept going and had little desire to stop. I completed all deadlifts with mixed grip, and I didn’t drop the bar until the last rep of each round. So, when I say I completed all rounds of deadlifts unbroken, that’s what I mean. Okay? Okay. Uhm, yeah, so I also completed all rounds of HRPUs unbroken, i.e., I didn’t rest at the bottom or top of pushup. Okay? Okay. I finished strong. There was just 20 seconds left on the clock when I began the last round of 15 deadlifts. I completed the very last rep with 1 second left on the clock. 70 burpees + 15 rounds = 310 reps. That’s 120 HRPUs and DLs. That’s an average of 14 burpees and 24 HRPUs/DLs a minute.